To witness a Pull Day is remarkable. The event itself is an absolute spectacle, a marvel, the proportions of which our lovely little college rarely sees. It seems that all of Hope College comes out to watch. They come to support friends, to cheer on their year, to support the new team, to marvel, to gasp, to hold their breath with us, and some, I imagine, come for the same reason people watch a train wreck- they just can’t look away. 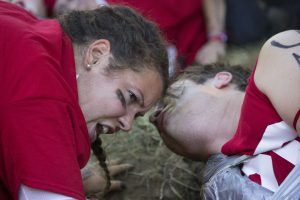 What they’re looking at is one of the nation’s oldest, longest lasting college traditions: the Pull. At Hope College, for over 120 years, twenty freshmen have lined up against twenty sophomores to test their mettle. Between them, as tradition dictates, must be the mighty Black River and a single length of shipping-grade rope. The rules are simple. Three hours. No half-time, no time-outs, no trick plays. With the junior and senior classes coaching the freshmen and sophomores, respectively, the young pullers are surely and rightly guided on their course. Beside them, twenty “moralers” become the puller’s senses, voice of reason, and life-line, as their hearing, sight, and spirit begin to fade. These are the players in “the tug-of-war the Gods gather ‘round to watch”. 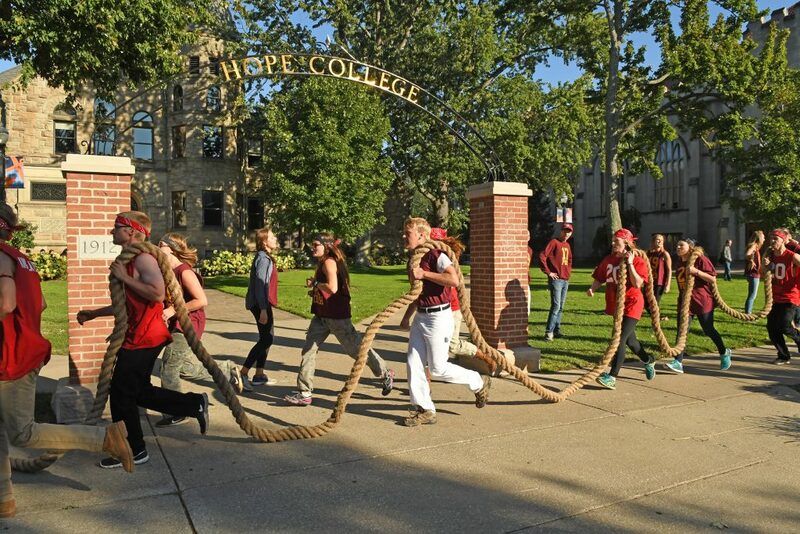 Hope College – The 2015 Pull event held on both sides of The Black River. The 2018 Sophomores won the event which lasted the full 3 hours. We don’t do it because it’s fun (although it certainly becomes quite fun). We don’t do it because it’s easy (it’s not). We don’t do it to party, or to waste time, to “blow off steam,” or because we’re “full of meanness” or any such nonsense. We do it for three distinct reasons: For each other, for tradition, and for ourselves. The Pull is the crucible in which iron-clad community is formed. Brotherhood and sisterhood convenes upon us here. There is no greater bond imaginable than with another with whom you have suffered. Together, we commiserate during weeks of grueling practice, training, and competition. We study together, we eat dinner together. We cry together at our defeats, celebrate together in victory, and rally together again when one of us falls. We do it for community, for harmony. Still, three and four years later, our best friends came from the Pull. This tradition served for us as a vehicle for the most intensive and important human bonding we have known in our lives. Hope College – Moraler LauraGrace Orner ’20 at the Pull on The Black River. Even beyond the community that’s formed, we do it for tradition’s sake. In a culture that is largely focused on innovation, the Pull reminds us that we “stand on shoulders of giants.” Pull represents what motivated, bright, and passionate young folks can do when given a task as difficult as maintaining a tradition over 120 years. To achieve this end, the Pull has had to evolve every few years over the last century, avoiding crisis and extinction time and time again. Notably, it has been college students sustaining this ritual over the years, carrying the flame through the storms of the changing times, continuing to provide freshmen and sophomores with an outlet for self-growth and community. It has been future lawyers, doctors, teachers, and people of influence – it is they who have been faced with the choice through the decades: continue or quit? We have modernized, sure. Although the collective “we” have changed some traditions, written rules, made Pull safer and more inclusive, we continue to carry a torch for generations to come and we will not cease. We carry a flame that seems to have grown fainter over the last decade, yet, it is with the passion of hundreds of years of students before us that we resound, “Pull is here to stay.” Pull is about tradition. The Pull, above all else, is about self-growth. To be brief, as a lifelong athlete, the physical and mental barriers that the Pull will ask you to break are unparalleled by those of any sport, club, or activity that I know. To “pull” is to reach deep into the recesses of your physical, and mental resources and, finding nothing left, giving more. To “pull” is to go beyond your physical limitations – to “morale” is to drain all available emotional resources and still find more to give. For the morale, the Pull demands complete selflessness. To morale you must ignore all physical pain, push away any emotional distractions, and quiet all senses. All that matters is the caller ahead of you and the puller at your side. Each practice, coaches stand in front of their morale, critiquing every minute movement. The Pull demands perfection, without it you will hurt your puller and your team. The Pull 2017 – Even Year and Odd Year Pullers prepare for The Pull. Every year Pull Alumni (on both sides) return to share how the Pull has taught them about their own limitations. They tell stories of challenge, of a great suffering, a deep loss. They tell us how they were able to overcome; they think back on the Pull, they recall their great strength and boundless perseverance, and they hear their coaches yelling, still, the oft quoted reminder that “pain ends.” Of course, pulling a rope will not teach you how to survive bankruptcy or mental illness, but it will, without a doubt, teach you about fortitude, sacrifice, and the spirit of continuation. There is no greater ally in life than this: self-knowledge and an unrelenting will. These have been revealed to us through the Pull. And to all those in our community who wonder, who ask, who can’t really make sense of it all, we extend to you the same plea. You’ll see. Whether you were a puller or a moraler – your bond, heart, spirit and dedication are the same. You can help support the Pull and other student activities like this, by making a gift today! Next Next post: One Big Weekend Top Ten | Events You Don’t Want To Miss!